I love it when I notice something new happening, like the renovation in my office I have been blogging about here these last few weeks. Though I have to say, I am ready for things to be set right again, in the usual order. Today, God captured my attention in the image of a kind of “blooming bush,” (photo above) and helped me to remember that even things that seem out of place belong. Precious things grow in creative new patterns when we allow them to. Blooms spring forth in ways they have never before. Newness of life happens when we share space with others and grow together in new ways. Welcoming new people is the primary task of the church. I think the creative act of combining things in new arrangements has made a life-giving difference in our world. That is exactly how (for example) innovative technology, medical treatment, and artistic expression contribute to our world. Maybe the church would be more welcoming of people, if we would also open our minds to welcome new ideas and new challenges, too. If we have no differences among us, there is no space for unity to emerge. 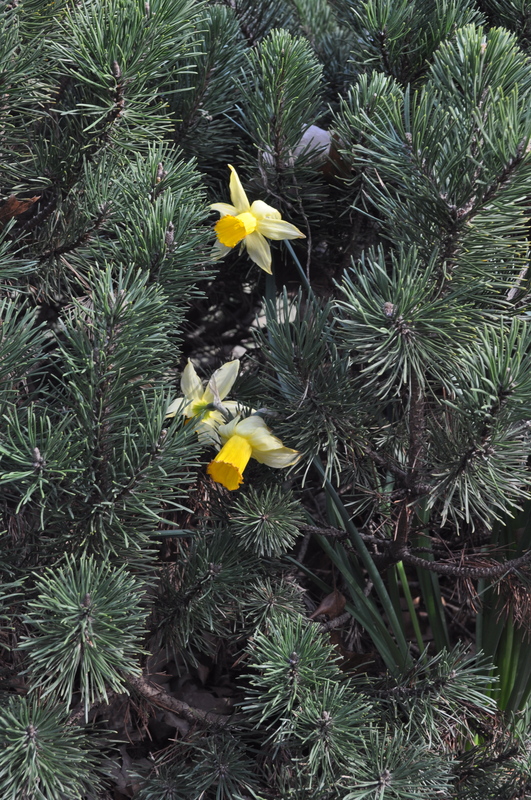 Look again, everything belongs, even daffodils within an evergreen. This entry was posted in Uncategorized and tagged Belonging, Church, Faith, Unity by Janet Salbert. Bookmark the permalink.